On 22 January 2017, the World Food Programme (WFP) launched the results of a study on a joint programme run by the Local Government Engineering Department (LGED) in Bangladesh and WFP to help rural populations cope with the effects of climate change. It reveals that people are less likely to sell assets, go into debt or resort to skipping meals when their lives are disrupted by the effects of climate change, if they have received a simple package of training and cash grants. Bangladesh is one of the most vulnerable countries to natural disasters and climate change, due to low-lying coastal regions and increasingly extreme weather conditions such as cyclones, floods and droughts. Significant swathes of the population still live with worrying levels of food insecurity, especially among the ultra-poor, who lack the means to adapt to natural hazards. 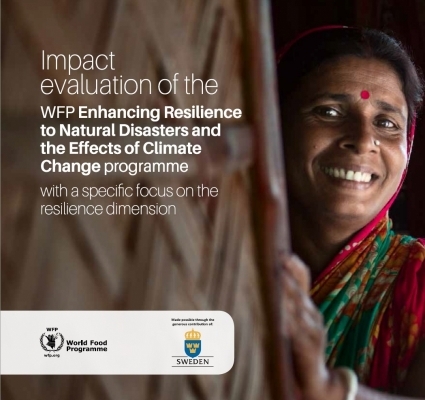 The programme “Enhancing Resilience to Natural Disasters and the Effects of Climate Change” started in 2011 as part of a joint initiative between the Government of Bangladesh and WFP. The programme is based on a shared understanding of the linkages between natural disasters, climate change, poverty, food insecurity, undernutrition and gender inequalities, and builds on the respective technical expertise and capacities of LGED and WFP. The package of interventions for participants includes community infrastructure work, training on disaster preparedness, capacity building, business development training and a cash grant to women for investment. The full evaluation report, is commissioned by WFP and led by an external research team of the International Centre for Tropical Agriculture (CIAT) and the Development Research Initiative (DRI) can be found here. It is part of the Climate Adaptation Management and Innovation Initiative (C-ADAPT). C_ADAPT is an initiative funded by the Government of Sweden’s fast-track climate finance that allows WFP and partners to explore innovative climate-induced food insecurity analyses, programmes and best practices, with the goal to help individuals, communities and governments meet their food and nutrition needs under a changing climate.